Cold air plunging into the north-central United States could bring the first snowflakes of the season to some communities at week’s end. People across the region may be breaking out winter attire and turning on the heaters for the first time this year. A direct discharge of Arctic air will sweep through the Canadian Prairies and into the far northern Plains into the weekend, according to AccuWeather Senior Meteorologist Brett Anderson. The cold sweep reached the northern Plains on Thursday and is forecast to plunge across the Great Lakes and a portion of the central Plains into Friday. Compared to earlier this week, temperatures will be slashed by up to 20 degrees Fahrenheit across much of Montana, the Dakotas and northern Minnesota, with highs projected to stay in the 40s and lower 50s. 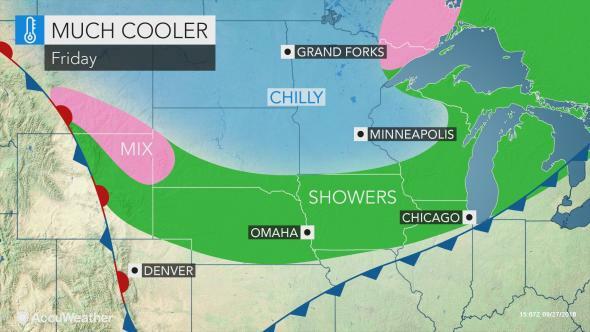 “There will likely be areas of frost and freezing temperatures from Montana through North Dakota into northern Minnesota on Friday night,” said AccuWeather Senior Meteorologist Jack Boston. The cold air will lose some of its punch by the time it reaches the Great Lakes and central Plains on Friday. Still, people from Chicago to Denver can expect a noticeable downturn in temperatures and may be grabbing an extra layer or two before heading out the door. A chilly rain will mark the leading edge of cold air from northern Montana to the Midwest into Friday, according to Boston. This includes in Billings, Montana; Rapid City, South Dakota; Omaha, Nebraska; and Des Moines, Iowa. Where is West Nile virus most common across the US this year? “Some locations could mix with or change to wet snow,” Boston said, adding that this risk would be greatest from Montana to the Dakotas. Spotty rain and snow showers may also skirt through northern Minnesota and the Upper Peninsula of Michigan at week’s end. Outside of the highest peaks in Montana, most of the region has yet to experience their first snowflakes of the season. The good news for those who mind the chill is that the cooldown will be rather brief for most of the region. Temperatures are expected to rebound by the end of the weekend across southern portions of the region. However, areas close to the Canadian border will likely remain on the unseasonably cool side into early next week.